Synchronised swimming is set to make a splash on the big screen this summer as a new film is released in cinemas across the country. 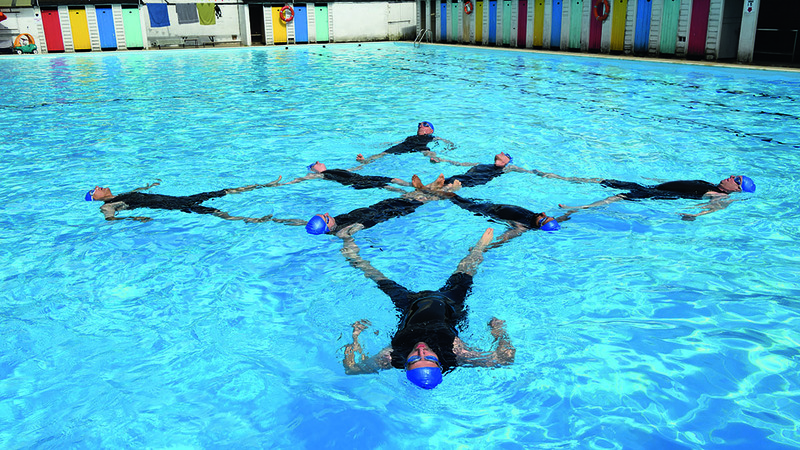 Swimming With Men stars actor and comedian Rob Brydon and charts the progress of an all-male group of synchronised swimmers. It is based on the real-life story of a team of Swedish synchronised swimmers and their bid to compete in the World Championships. Their journey was originally featured in the documentary Men Who Swim. Rob plays the role of Eric, an accountant who is suffering from a full-blown mid-life crisis when he meets a group of synchronised swimmers during a visit to his local pool. The star-studded cast also includes Rupert Graves (Luke), Thomas Turgoose (Tom), Adeel Akhtar (Kurt), Jim Carter (Ted), Daniel Mays (Colin) and Charlotte Riley (Susan). Synchronised swimmers Chris Jepson (Silent Bob) and Ronan Daly (New Guy) make up the team. It’s a heartfelt, amusing story and cast members hope it will lead to more men taking up the sport. Downton Abbey star Jim Carter said: “If someone is a decent swimmer but thinks doing lengths is a bit boring, it might be worth giving synchronised swimming a go. Karen Thorpe, Swim England’s talent manager for synchronised swimming, said: “It’s great to see synchronised swimming feature so prominently in a major new film – and we’re especially pleased Swimming With Men focuses on an all-male team. “Synchro is an activity for everyone. It’s a sport that combines creativity, expression, choreography and music interpretation and is for all ages and abilities. “There are thousands of synchro swimmers across the country and while it’s traditionally been seen as a female dominated sport, more and more males are now taking part.